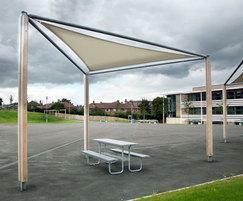 The Sheldon Solar Shading Unit SPG308 is a free standing stretched fabric shelter that although doesn't provide much protection from the wind or rain will give areas of solar protection for benching and dining in the midday sun. The galvanised steel frame structure can be powder coated to fit with existing colour schemes and clad in a selection of timbers to match other elements of the street furniture package. The stretched canopy fabric is also available in a range of bright colours to either make a design statement to the project or to seamlessly blend into the background for a more subtle effect.